Roundabouts are often disliked by cyclists because using them by bicycle can be fraught with danger. When riding on a roundabout, you rely upon drivers seeing you on your bike. There is a tendency for motorists to look right through cyclists while looking for other motor vehicles, hence the frequency of "SMIDSY" incidents. However none of this has to be the case. 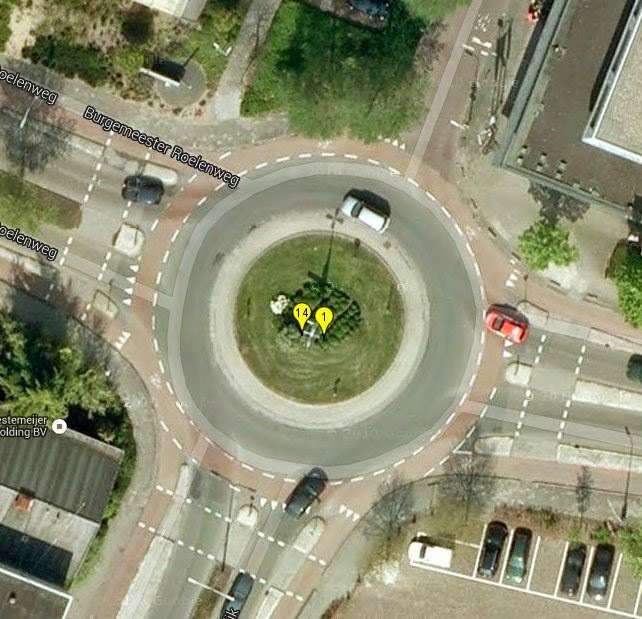 The best Dutch roundabout designs do not cause significant danger for cyclists. 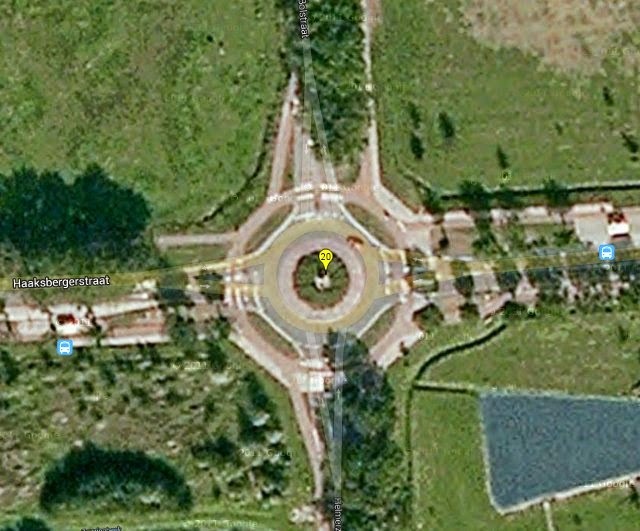 But note that not all Dutch roundabouts are created equal. 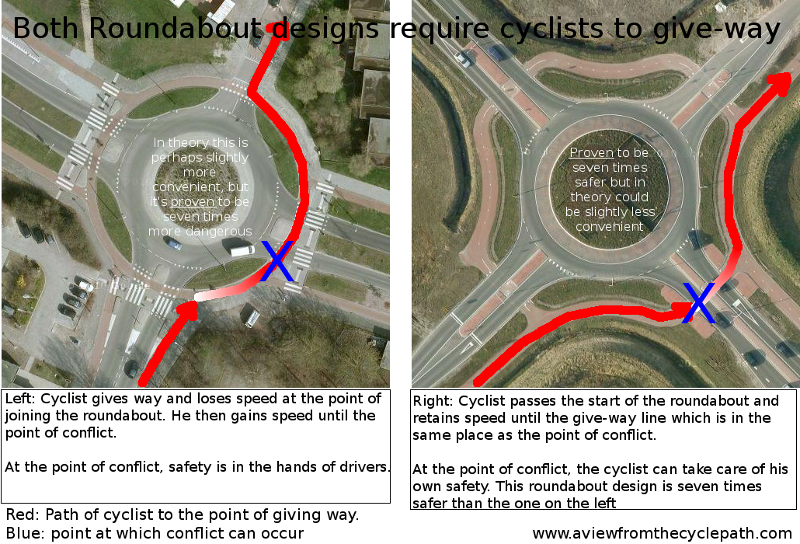 There are big differences in the safety of different designs of roundabout used in the Netherlands, and not all advice from this country emphasizes the safest design. This blog post is mainly about this roundabout. It's an urban roundabout used by a large volume of traffic including pedestrians, cyclists, cars. buses and trucks. It's interesting because of its very good safety record - just four crashes in five years, all minor car-car crashes, none of which involved a pedestrian or cyclist and none of which caused an injury to anyone. 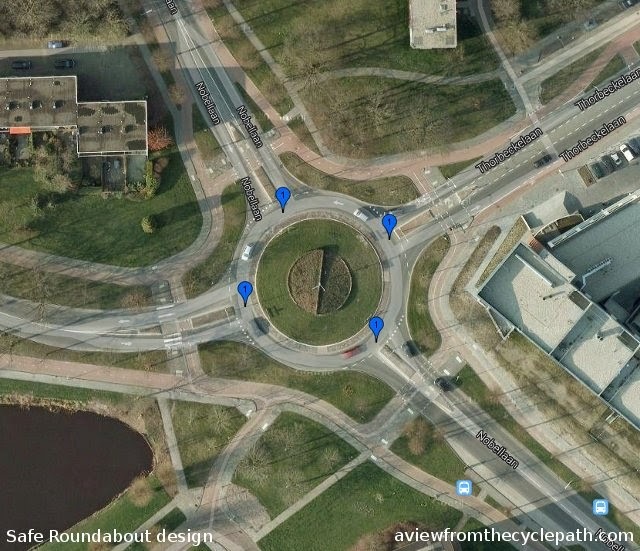 There is a common misconception held in other countries that Dutch roundabouts are safe for cycling due to their geometry, but actually the roundabouts of Assen, just as other Dutch cities, vary enormously in design. 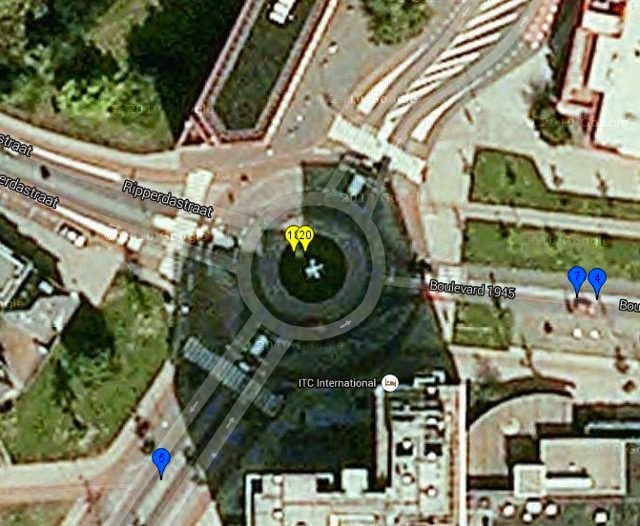 The geometry of Dutch roundabouts is not the common factor which makes them safe. What makes them safe is removing cyclists from harm's way and the safety of different Dutch designs comes down very much to how well they keep cyclists away from potential injury. In the Netherlands it is not expected that cyclists should be mixed with motorized traffic on roundabouts. There is always a cycle-path or lane of some form. While cycle-lanes around roundabouts are not generally thought to work well. there are two opposing views on how these cycle-paths should be designed. One view holds that cyclists should have priority across each road leading to the roundabout, the other holds that it is dangerous for cyclists to have this priority. The current recommendation1 is for roundabouts within towns to be the "cyclists priority" design while roundabouts outside towns give priority to motor vehicles, and many towns in the Netherlands have adopted these recommendations. However, not all towns have done this and Assen is one of the hold-outs. The roundabouts in Assen have a particularly good safety record even by comparison with other Dutch roundabouts in other Dutch cities. During the five year period between 2007 and 2012, there were just two cyclist injuries at all the 21 roundabouts combined. The impressive safety of Assen's roundabouts is in part due to the city having ignored the recommendations made in the CROW manual and having retained motorist priority on each of the crossings. This may sound as if it makes cycling less convenient, but we have not found this to be a significant problem. It's rare that a cyclist must put their foot down and stop. It is more often the case that cyclists adjust their speed and merge through any traffic which is crossing the roundabout. That is actually much the same as a cyclist would do on approach to any other roundabout design. In reality you must give way at some point or another on entering any design of roundabout. All that changes between these two designs is at which point you must give way. 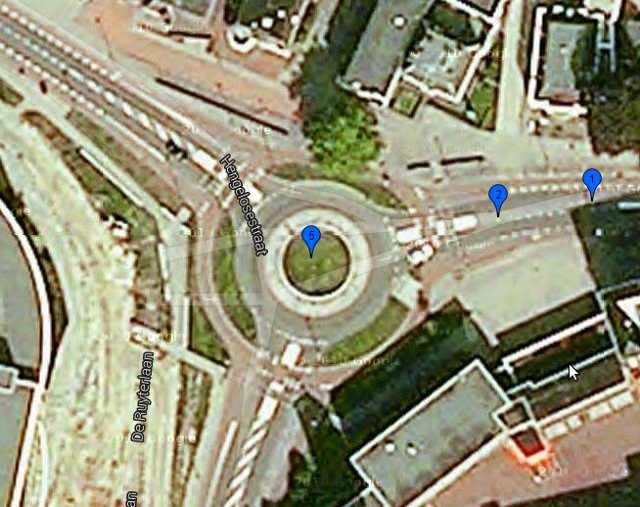 The design of Assen's roundabouts results in crossings of roads always being at 90 degrees and the 90 degree crossing point being where cyclists must give way. This makes it easier for both drivers and cyclists to see what is happening in all directions of interest. This roundabout design also makes sight-lines longer which gives more time to react, more time to adjust speed so that it's almost always possible to cross without stopping. Both of these result in safety advantages over the other Dutch roundabout design which has an annular ring. With this design, a significantly higher degree of safety is achieved in exchange for perhaps a very slight decrease in convenience. But the decrease in convenience is really not large as people often fear, especially when we take into account that cyclists can cross safely in both directions around roundabouts where the crossings are at 90 degrees. This saves time because it's possible to take a short-cut across the junction and reduces exposure to risk as we need cross only one arm of the roundabout to make a left turn instead of more if we had to ride all the way around the roundabout to make a left turn. Please do watch the video as it demonstrates clearly how efficient and safe this design is. Note how at the start of the video it is demonstrated that it is possible to travel across this roundabout by bicycle without adjusting one's speed at all. This would not be the case with a "cyclist priority" roundabout or by cycling on road as in both cases a reduction of speed would have been necessary at the point of reaching the roundabout. than the design which I recommend. 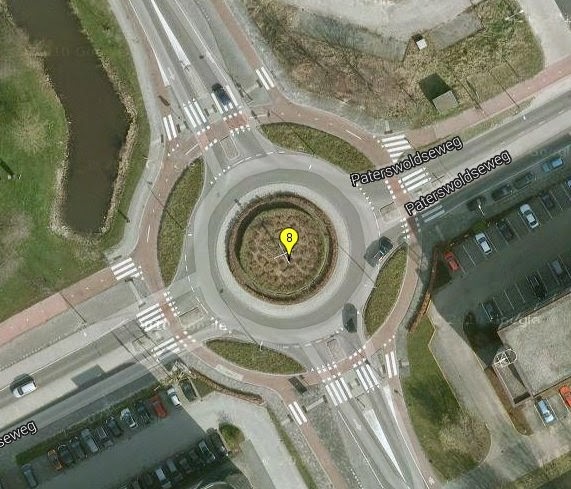 It has been known within the Netherlands for many years that roundabouts which have annular ring cycle-paths and on which cyclists have priority over each arm are less safe than those of the design which we have in Assen (nationally, SWOV estimated an extra "52-73 in-patients a year"). The decision to favour the cycle priority design was taken in an attempt to increase cycling convenience at the cost of safety. The safety cost of choosing cycle priority will almost certainly be greater in other nations than it is here in the Netherlands. Dutch drivers are more familiar with bicycles than drivers of other nations and there is also a good chance here that bicycles will dominate any particular roundabout, making them difficult to ignore or overlook. Neither of these factors can be relied upon in other countries. For that reason I suggest that the safer design presented here should be the only roundabout design for cyclists adopted by other nations. 2018 update: The number of roundabouts in the Netherlands has doubled since the report was written. Because the dangerous priority design was widely adopted there are now 100-150 injuries requiring in-patient treatment at hospital and concerns about the rising number of casualties due to this dangerous design. Please read more about this in a new blog post about this subject. The priority design has proven not to be beneficial to cyclists in this country and it won't be beneficial in your country either. How much safer is this roundabout design ? recommended here is very much safer. People keep asking me how much safer this roundabout design is than the "priority" design and if there are any figures to prove this. The document linked two paragraphs ago (there's an English language summary on page 5) gives the answer quite clearly. The annular ring design with cyclist priority is 11% safer for cyclists than an un-signalled junction while the same annular ring design without cyclist priority is 87% safer for cyclists. i.e. The expected injury rate due to cyclist priority alone, on the annular ring design, is nearly seven times higher with cyclist priority ( (1-0.11) / (1-0.87) ~= 6.85). However the design which I recommend is specifically designed in order to improve sight lines and also to lower both cyclist and driver speeds at the point of conflict (rather than slowing cyclists only at the point of joining the ring). We can therefore reasonably expect that this design will be associated with better injury rates. Combining both the improved sight lines and the better result for priority should result in a much better than 7x improvement in safety. The difference in outcomes suggests that estimating that the improved layout results in at least a 2 or 3 times safety improvement is quite conservative, leading to the safe design described above being at least 20 times safer than the unsafe design with cyclist priority. There is no need to guess as we do have figures. We see a very obvious result in real life statistics for roundabouts. Injuries are rare at the design which I recommend, while they are remarkably common where the annular ring design is combined with priority for cyclists. Remember that these figures come from real injury statistics in the Netherlands, with Dutch drivers who are familiar with cyclists. There is likely to be a much greater difference in safety should the same designs be tried in other countries where drivers are less familiar with and less respectful of cyclists. Note that the 11% improvement in safety for the priority roundabout design over an un-signalled junction for Dutch cyclists with Dutch drivers is a very small figure. You shouldn't necessarily expect this to apply for cyclists in other countries from the same design. It may even be that the situation is worse than an un-signalled junction in other countries. But the very strong result from the safe roundabout design is likely to still have some significance in other countries. The comparison between these two roundabout designs has in some places taken the form of an argument about safety vs. convenience. There is an attempt to paint the added convenience of one type of roundabout as a certainty while the safety advantage of the other is played down as being "very slight". In fact, it is proven that the safer design (as recommended in this blog post) is seven times safer for cyclists than the other design, while the relative convenience of the designs is open to debate. I find that the safer design is also very convenient. If you doubt this, please watch the first 80 seconds of a video in which I demonstrate how I regularly cross the roundabout illustrated above in both directions without stopping. While the design on the left is often referred to as a "cyclist priority" roundabout, cyclists actually have to give way on both types of roundabout. The main difference is that the point where you give way is not coincident with the point of conflict on the design on the left while it is coincident with the design on the right. This means that the cyclists at most have to slow down and speed back up once with the design on the right and can do so while assuring their own safety. 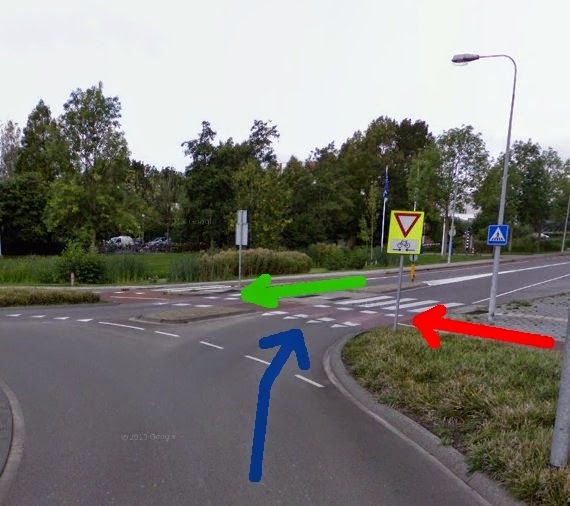 Note that drivers have to give way at the same point on both roundabouts, and that giving way to cyclists in the Netherlands is significant because there are often more cyclists than drivers using junctions in this country. The case shown above is a best case so far as the "priority" roundabout is concerned. Sometimes they are very much less convenient as can be seen in a video. park which does not injure cyclists. I chose this particular example for the video because it's very clear what is going on. It's large and it's relatively green for an urban location, but this makes makes it easy to demonstrate in a video how the roundabout works. The principles which make it safe (90 degree crossings, good sight lines, plenty of time to make decisions, obvious priority, some journeys made without joining the roundabout at all) can be, and often are, applied on a smaller scale. from a recent study tour. The smaller example illustrated here applies all the same principles as the main example above but on a much smaller scale. It could in fact be made smaller yet. There have been no cyclists or pedestrians involved in a crash here. Only two minor fender-benders between motorists are recorded, neither causing an injury. 90 degree crossings between cyclists and drivers to improve sight-lines of both. Not relying upon drivers to take decisions which maintain the safety of cyclists or give way on behalf of cyclists but giving that control to cyclists themselves. Adverse camber for cars going around the roundabout to slow cars down. Refuges between streams of motor traffic which are wide enough to accommodate a whole bicycle. Bidirectional cycle-paths because they allow cyclists to cross fewer streams of traffic - crossings are where the dangerous interactions occur. Right turns take place with no interaction at all between cyclists and motor vehicles. The layout makes it very obvious to everyone what they should do. CROW suggest that roundabouts are appropriate only on junctions with up to 500-1500 motor vehicles per hour on the busiest arm of the roundabout. Note that that is a peak not an average. It doesn't imply safety with 12000-36000 motor vehicles per day, but that the peak hour should be 500-1500 max. Most roundabouts in the Netherlands have flows considerably lower than the maximum allowed. Where more vehicles must be catered for, they suggest not having cyclists going around roundabouts at all, but using other junction types such as traffic light junctions or cycle unfriendly multi-lane roundabouts which then require grade separation (see next section). Too little space ? Too much traffic ? other really good junction design. If you are looking to copy these principles but there is not space for a safe roundabout in your location then perhaps a roundabout is not the correct solution for you. There are other possibilities. Simultaneous Green traffic lights can work even for very small junctions, but in the Netherlands note that many traffic light junctions in small streets have been removed altogether, along with the motor traffic which they used to serve. By doing this, a safe situation can be achieved almost anywhere. For a complete picture of all the complex junctions in Assen, see previous blog posts about every roundabout in Assen and every traffic light junction in Assen. Another factor which leads to the safety and convenience of Assen's roundabouts is that they are largely avoided by cyclists. Bicycle routes here are unravelled from driving routes. Many of the 21 roundabouts feature only infrequently on cyclists' journeys or do not feature at all. This roundabout is even safer for cyclists, but it cheats by not really being a roundabout for cyclists at all. Grade separation should be the norm where cycle routes cross busy ring-roads which pose a safety risk. 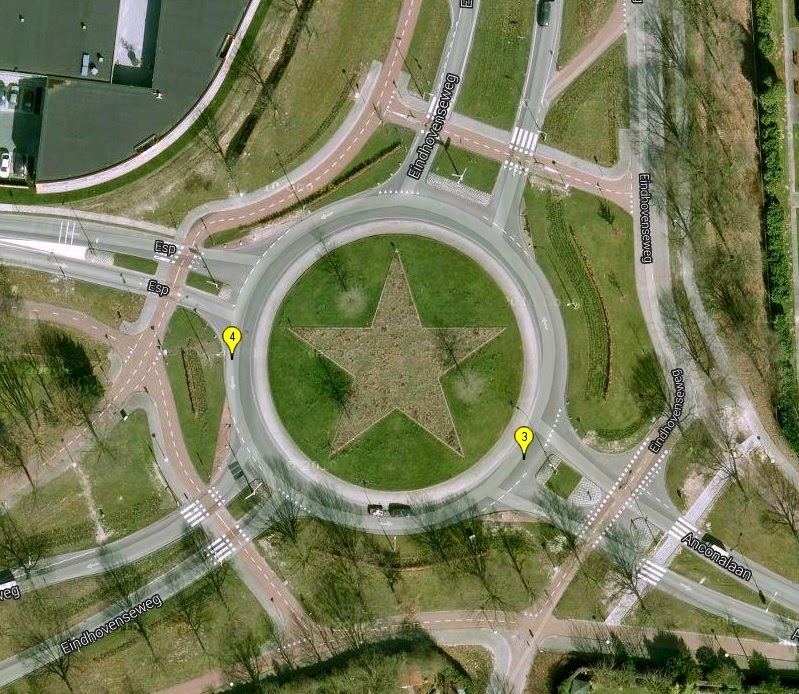 Below you'll find examples of other roundabout designs used elsewhere in the Netherlands. Most of these examples have a less convincing safety record than the examples illustrated above. They're shown along with their safety records in order to demonstrate what does not work well and should not be emulated elsewhere. Drachten is a smaller town than Assen a few kilometres to our west. 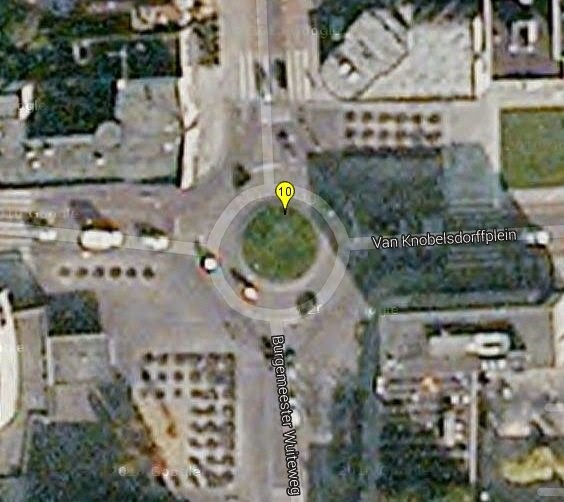 Laweiplein Shared Space "squareabout" in Dracthen. There have been ten crashes here, injuring three cyclists and one moped rider. This single Shared Space junction is more dangerous for cyclists than all of Assen's 21 roundabouts and all of Assen's Simultaneous Green traffic light junctions added together. Assen. Absolutely no bikes near here. There has been an unfortunate mis-understanding in the UK over turbo-roundabouts with at least one council seriously trying to implement a turbo-roundabout for cyclists. This is a huge mistake. Turbo roundabouts are designed to maximize flow of motor vehicles. They're a good design for motorway junctions and similar places where there are many motor vehicles and absolutely no cyclists or pedestrians. Note that Turbo roundabouts are also recognized to be dangerous for motorcyclists. Motorcycling groups have complained in the Netherlands. See the first picture below. Groningen, which won the Fietsstad competition in 2002, is famous for having the highest cycling modal share in the world. This is the result of policies starting in the 1970s and it is also contributed to by the extremely high student population. Unfortunately, the city has not progressed so well since 2002 as it did in the years before it was awarded a prize. Local campaigners have been vocal about this. Groningen's infrastructure is variable in quality but problems caused by this are to some extent masked by the high level of student cycling. This busy Groningen roundabout is the scene of 36 incidents in five years resulting in injuries to two pedestrians, three cyclists and two moped riders. This is not good design. A suburban roundabout, relatively low traffic but with 18 crashes including six cyclist injuries. This roundabout has different geometry to the other three and better sight lines. In particular, there is a wide verge the length of a car between the roundabout and the cycle-lane. This gives a space in which drivers can stop between the road and the roundabout in a similar manner to how it is possible for them to do so in the example above from Assen. However this detail but that hasn't prevented there being 8 crashes here. One cyclist and one moped rider were injured. I write about an experience at this roundabout below. Just outside Groningen to the South we find a roundabout more similar to the design used in Assen, with better sight lines and where motorists have priority. At this roundabout there has been just one collision between a motorbike and a bicycle which unfortunately caused an injury. The vertical grey line in the roundabout is a sculpture. Zwolle is the current holder of the "Fietsstad" award, an occasional award presented to the Dutch city which is considered to be trying hardest to grow cycling. Zwolle achieved an amazing amount of positive press last year for an unusual "bicycle roundabout" (fietsrotonde) junction design. This unproven design was even used as part of the marketing campaign for the city's Fietsstad competition entry. The "bicycle roundabout" works as a roundabout for cyclists while for drivers it is a straight through road. The kerbs are narrow, sight lines are short and crossings are not at 90 degrees. Press releases about this junction and other sources have made claims made about its safety but in my view praise should wait until there is a proven record of safety. That is why I did not write about this junction before now. We must first wait to find out what the long term safety outcome is and until then treat the new design with caution. This is especially not something for other nations to try to emulate. It is claimed that Zwolle drivers' familiarity with existing roundabouts will lead to the bicycle roundabout being safe. I see this as spurious as while Zwolle doesn't have many other roundabouts those that it does have actually do not have a good safety record at all by Dutch standards. There are some examples below. 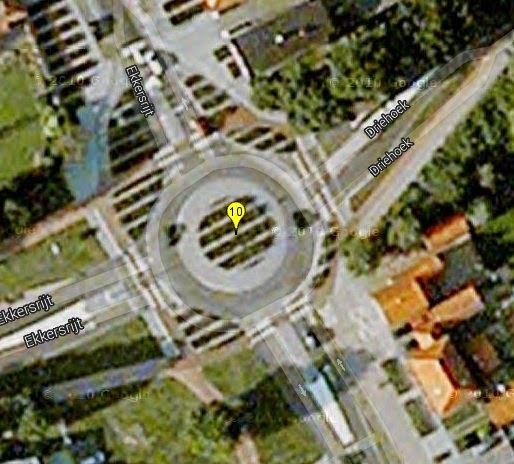 Update: I've discovered that the Bicycle Roundabout in Zwolle has in fact already claimed victims. It opened at the end of August 2013, the first cyclist injury was in September and another cyclist was injured in November. Zwolle's Bicycle Roundabout has therefore claimed as many victims in three months as all twenty-one of Assen's roundabouts caused in five years. Even relative to the previous supposedly unsafe situation this doesn't seem very impressive. According to the Ongelluken Kaart, there was only one injury in this location in the five years between 2007 and 2012. Also read how the Bicycle Roundabout was advertised in advance as part of the effort to win the cycling city (fietsstad) award. Further update: Thinking more about this, it seems that the whole idea of the "bicycle roundabout" is flawed. Compared with the unsignalled junction which existed before it was built, a normal roundabout of the type used in Zwolle might be expected to achieve a 75% reduction in injuries to motor vehicle occupants but just an 11% reduction in injuries to cyclists. However, the bicycle roundabout as built doesn't meet good guidelines even for that type of roundabout. Sight lines are very short. What's more, given that part of the reason for enhanced safety for cyclists at a normal roundabout is a result of drivers being able to make a choice not to exit the roundabout at a point where there is conflict with cyclists, and given that in this instance that choice has been removed and drivers are forced to exit in conflict with cyclists, there seems no good reason at all for anyone ever to have assumed that this design would in fact be safer. Therefore the elevated injury rate due to the bicycle roundabout should be no surprise to anyone. Update 2018: In a reader's poll in a local newspaper, the Fietsrotonde was chosen by cyclists of Zwolle as what they believed to be the most dangerous place in the city for cycling. Perhaps more worryingly, even though it had been improved since I wrote this piece, the first roundabout featured below is still of the priority design the the council now admits that this is the most dangerous place in the city for cyclists. If Zwolle had instead converted the roundabout into the the safe design which I recommend then this would not have happened. 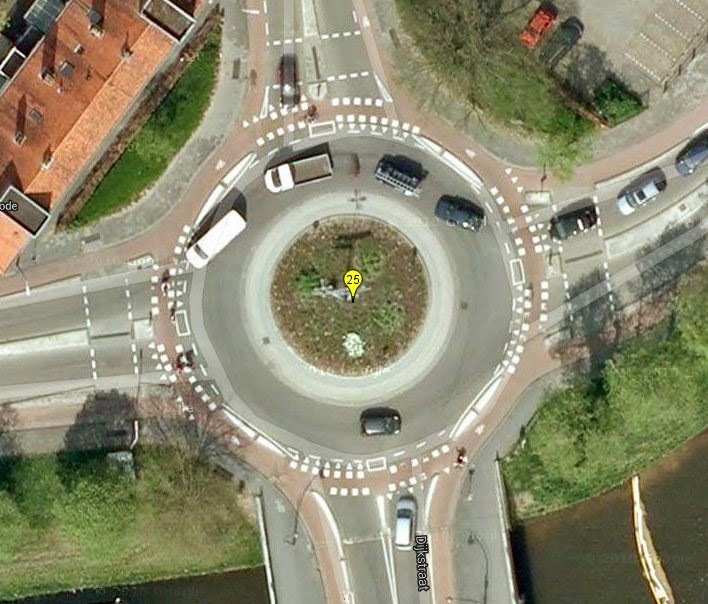 Update 2018: Zwolle completely rebuilt this roundabout, but instead of choosing the safe design featured at the top of this blog post they changed to a different unsafe design so this continues as the most dangerous location in Zwolle for cyclists. Zwolle Suburban roundabout with priority for bikes. 25 crashes here including six cyclist injuries. This junction resembles the design used in Assen, but it is truly enormous in scale. It gives cyclists priority. The crossings are far from corners in the cycle-paths and far from the roundabout, which itself has a much larger radius and will support higher speeds. Perhaps it is the resultant speeds of both cyclists and motorists alike at the crossings which adds danger here. Two cyclists have been injured here in five years. On the other hand, this enormous multi-laned roundabout in Eindhoven has caused no cyclist injuries at all. Why ? Cyclists are completely grade separated from motorists. Therefore, despite the huge size of this road junction, it is both safe and convenient for cyclists to use. This is the Floraplein in Eindhoven. A turbo-roundabout. Turbo-roundabouts are designed for maximum flow of motor vehicles and should never be built where there are cyclists, but this one was. There has been much local opposition to this roundabout including a protest video showing the problems that it causes. I featured a video of this roundabout in a blog post from 2012 in which I warned against campaigners mistakenly calling for this infrastructure for cyclists. Needless to say, between 2007 and 2012 there were multiple collisions here, several involving cyclists and one cyclist had to go hospital as a result. Valkenswaard roundabout visited in 2006. Not a safe design. Valkenswaard is a village outside Eindhoven which we visited on the 2006 study tour. At that time I was myself impressed by the idea of cyclists having priority on roundabouts. Of course everyone is attracted to the idea of priority, but when we find out that the statistics show this design to unsafe, resulting in people having been sent to hospital because of injuries which occurred here we should of course think twice about the value of such a design. In 2006 our group spent some time looking at and riding around this one roundabout in particular as cyclists had priority there. That's why I've included this village in these examples. We now know that this wasn't really a good example to take notice of as even though this is just a small village and there is little traffic here, this roundabout is the site of quite a number of cyclist injuries. Compare this photo with the new Zwolle bicycle roundabout (above). The obvious similarity is part of why I am skeptical of that new design. A roundabout which the 2006 study tour group were somewhat enamoured by. It's in a relatively low traffic situation suburban but there have been seven incidents here including three cyclist injuries. i.e. even this single roundabout in a small village is more dangerous for cyclists than all of Assen's 21 roundabouts put together. This is because the annular ring design is more dangerous for cyclists even when traffic volumes and speeds are low. Outside Valkenswaard, a rural roundabout without priority for bikes. Just one crash, no injuries, no involvement of cyclists. Outside Valkenswaard, a busier roundabout without priority for bikes. No cyclists involved in crashes here. The roundabout between the Knalhutteweg and Broekheunering in Enschede used for the investigation into cyclist safety with priority on roundabouts. There were 23 collisions in five years here, two of which injured cyclists, while two more injured a moped rider and a pedestrian. 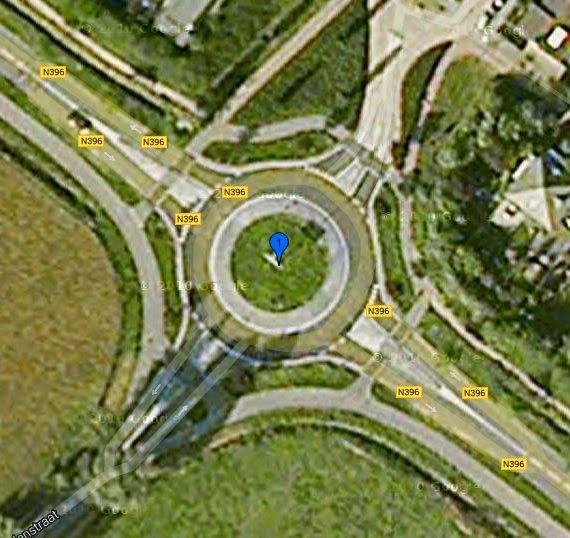 For cyclists, this roundabout, used so often to "prove" the safety for cyclist priority, as shown itself to be as dangerous as all 21 roundabouts in Assen combined. A few hundred metres to the North, this is the roundabout between the Knalhutteweg and Vlierstraat. At this location, there have been 15 crashes and no fewer than five cyclists injured in five years. Closer to the centre of the city, this roundabout has been the site of 38 crashes. In this case only one cyclist was injured, but two car occupants were also injured in one crash. Another Enschede roundabout. This example has had 20 crashes over 5 years. Six cyclists were injured here. 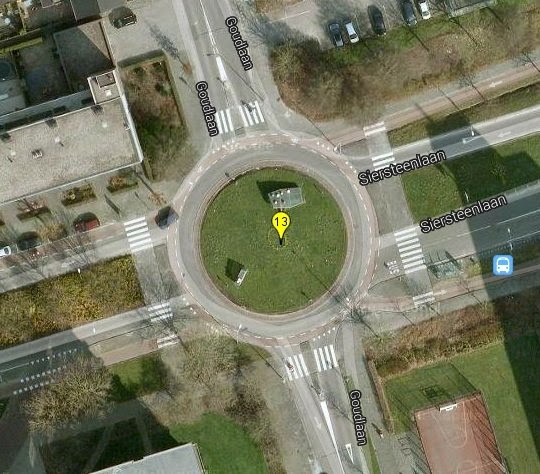 Looking for relatively good examples from Enschede, I found this "roundabout", the location of just five minor crashes and no injuries over five years. Suspicious of the exposed ground on the left of the picture, I looked at Streetview which revealed that this wasn't a roundabout at all during the time when the statistics were counted. It will be interesting to see what happens here in the future. Will converting this previously very safe junction into a roundabout lead to a safety improvement ? 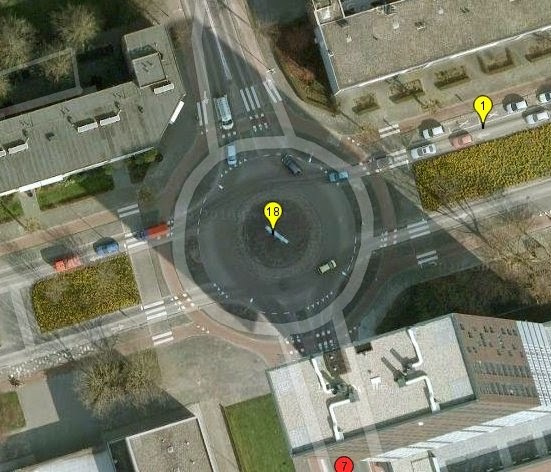 Fietsberaad still have the Enschede roundabout as a good example on their website. I disagree. 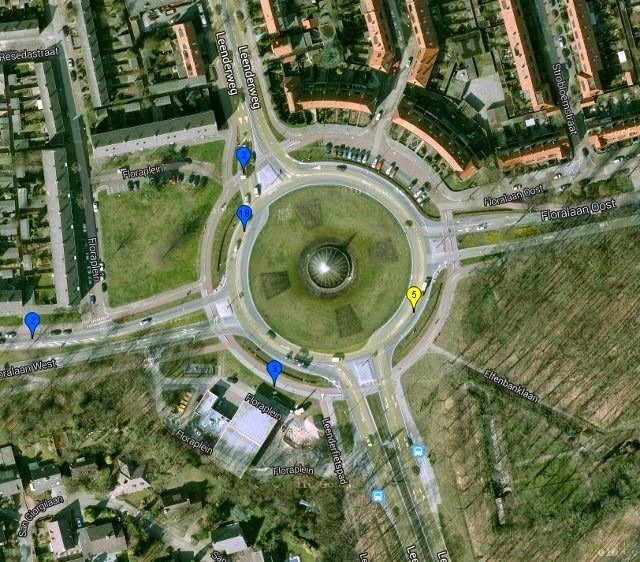 The four roundabouts in Enschede that I feature above have wounded 14 cyclists in five years. That's seven times so many injuries as all 21 roundabouts in Assen combined. This gives each of the Enschede roundabouts which I looked at a safety record on average 36 times worse than an average roundabout in Assen. The roundabout in Purmerend near the software company "Archie CRM" has caused many crashes. It is recorded that twelve crashes occurred and that those crashes injured six cyclists such that they required hospitalization in just the two years of 2008 and 2009. There's a lack of data for other years but the design of this junction has not changed. 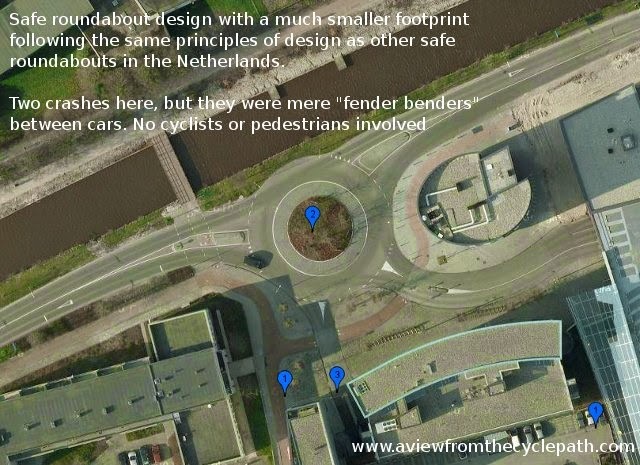 Den Bosch is another of the cities where the more dangerous design is preferred and another where the most dangerous junctions for cyclists are roundabouts. The most dangerous junction for cyclists in 's-Hertongenbosch is this roundabout which caused hospitalization injuries to five cyclists and three moped riders in the three years between 2008 and 2010. These are not good examples of roundabouts to copy from. It seems I need to explain more about why the roundabouts with priority dangerous, regardless of their layout. It's not just that the annular design of cycle-paths makes visible difficult but also that it expects perfect behaviour from drivers. Giving cyclists "priority" sounds positive, but what actually happens with the priority design of roundabout design is that cyclists are stripped of control. The design requires that cyclists should ride out in front of motor vehicles and hope for the best. On this type of junction design, cyclists are used as mobile traffic calming devices. The cyclist priority design requires that drivers who don't know the rules, are tired, talking on the telephone, changing channel on their radios, arguing with other people in their cars, who can't see out of misted windows, who are impatient and don't want to stop for a cyclist (especially important in other nations where there is more anti-cycling sentiment than here) or who are simply not skilled at driving must never make a mistake because the safety of cyclists depends almost entirely on the driver and not on the cyclist themselves. My view is that cyclists make better decisions about their own safety than drivers can make for them. This is supported by the comparative injury statistics above for roundabouts which give cyclists control over their own safety vs. those which give them "priority" or supposedly let them share equally with drivers. An incident from earlier this week may help to explain. Judy and I rode nearly 80 km planning a cycling holiday route and we passed seven roundabouts on our way. Five of them were of the safe design and were crossed without stopping. One was of the safe design and we had to wait about ten seconds. Just one of the roundabouts on our route was of the "priority" design. This just happened to be the same roundabout as I had already written about above as one of the safest in Groningen (it has better sight-lines than many and there have been 'only' eight crashes). On this roundabout, we needed to go straight on (second exit) so joined the annular cycle-path. At the same time as I joined the cycle-path around the roundabout, a learner driver who had been travelling parallel with me with his right indicator flashing joined the roundabout. I had to trust that the learner had seen me, that he understood the priority rules and that he was going to stop. He did, but he did so a little late and his front bumper was uncomfortably near the cycle-lane. My attention was distracted by the learner approaching from my left and I wasn't looking out for the driver coming from my right who had also not been paying attention and who stopped her car very sharply half way across the cycle lane in front of me. I had to swerve to avoid her car. There was no crash and both these drivers stopped, but they both did so too late. With slightly different timing, for instance if either the drivers or myself had been going slightly faster or slightly slower, it could have worked out differently. This is not fail safe design. SWOV point out that "drivers have to make (too) many observations in a brief time span, resulting in them noticing cyclists too late" and that is precisely what seems to happen at cyclist priority roundabouts. That is but one anecdotal illustration of the type of incident which simply doesn't happen with the roundabout design which I prefer, and which has been proven to be safer. We have known for more than a hundred years that we cannot rely upon perfect behaviour from drivers but this is what the priority roundabout design does rely upon. Instead of cyclists being able to take safety into their own hands, their control is taken away and their safety is assured only by drivers behaving perfectly. The roundabout priority design flies in the face of the sustainable safety principles which otherwise keep Dutch roads safe. drtivers. Perfect safety record here. Don't confuse the concerns about safety at roundabouts with priority with other locations and situations. It is never helpful to try to apply a one size solution to all problems. Concerns about roundabout priority do not apply in other situations. There are many thousands of safely designed junctions between roads and cycle-paths, here in Assen and elsewhere in the Netherlands, where cyclists have priority. Where this is the right solution. i.e. junction design is good, sight lines are long and traffic volumes and speed are not overly high, these junctions have very good, often perfect, safety records. It is the existence of such infrastructure which makes cycling both convenient and safe in the Netherlands. Book a study tour to find out more about good junction design and other factors which lead to the high rate of cycling and good safety record for cyclists in the Netherlands. 1 The CROW Design Manual for Bicycle Traffic states that "On roundabouts inside built-up areas, it is recommended that cyclists on separate paths continue to have right of way. After all, this corresponds with a cyclist-friendly policy". I disagree that this is the best way to design roundabouts, especially when considering road conditions and existing road use conventions in other nations. The CROW manual also refers to low traffic (less than 6000 pcu/day) roundabouts as not requiring cycling infrastructure. In reality, roundabouts in the Netherlands without cycling infrastructure are roughly as common as unicorns. I can't remember seeing a single example. Part way through writing this blog post, several people drew my attention to the new Austroads document about cycle-lanes around roundabouts. They came to a correct conclusion that encouraging people to cycle around the edge of roundabouts is a bad idea, but their suggested fix (sharrows to encourage cyclists to "take the lane") is not adequate. The design presented above works well for all abilities of cyclist. This post originally referred to 19 roundabouts in Assen which I had written about in a previous blog post. That has now been updated to cover an additional two roundabouts which I overlooked. These had also not injured cyclists. Moderately low traffic, although it is on a bus route. Has been in its current form for at least twenty years. bz2: Thanks for that. There are always counterexamples - but the fact that I'd have to travel more than 200 km to find this example, and that it is rather old, really makes my point for me: These are rare. In this case it would appear that there is little problem caused because there is little traffic. Anything will do as cycling infrastructure when there are few cars. The point of cycling infrastructure is to remove the cars from where the bikes are. So, there are more collisions on roundabouts with priority for bikes, but it hard to tell just from the total number of incidents how safe they are for cyclists using it properly, since it's cyclists riding in a "wrong" direction (and also moped riders) who endanger themselves most - exactly the same issue as with ordinary junctions with priority for bikes. There is a different kind of risk on a roundabout with circular cycle path than, say, roundabout with mixed traffic - in the first case you can stay safe, just don't assume that every driver will give way to you and slow down if you're unsure. Well, it's more difficult when a cycle path is close to the roundabout carriageway, but it turns out that CROW recommends priority for cyclists even when there is no space for a waiting area for cars. A roundabout cycle lane "creates the impression [cyclists] are exiting the roundabout even when still continuing"
(http://www.rupprecht-consult.eu/uploads/tx_rupprecht/09_PRESTO_Infrastructure_Fact_Sheet_on_Roundabout_Intersections.pdf) which is probably also a problem on many roundabouts with a circular cycle path. But maybe this can be fixed by such spiral "turbo roundabout for cyclists", where it's clear as early as possible in which direction cyclists are going? It would probably be "safer" not to give priority for bikes also on ordinary junctions, but would it really be a good idea? Many politicians and planners in car-centric countries think so, but I don't. Maybe in this countries it's even more important to give cyclists priority on urban roundabouts so that people cycle more often, even if this would result in more collisions. user1: The safe roundabout design can allow cyclists to travel in both directions yet this does not impact on safety. Indeed, the very example that I illustrate above allows bidirectional use (I very often ride across arms of this roundabout in the "wrong" direction). The dangerous design is more dangerous than this whether or not it has bidirectional paths. It doesn't require bidirectional use to make it dangerous. The spiral exit idea is interesting, but it's another unproven suggestion which might help to improve the safety of the unsafe roundabouts, or equally might not. We have enough unproven designs already. e.g. the example in Zwolle in the blog post above. There is already a safe roundabout design - we just need to use it. As for cyclists losing priority on ordinary junctions, why bring that up at all? I've certainly not suggested it. In fact, this design improves convenience for cyclists. Watch the video again and note how it starts by showing a part of my route into town, on which I never have to stop for this roundabout. Later on I show a woman turning right who also never would have to stop. These two examples are important because a large percentage of journeys past this junction by bicycle involve no interaction with the roundabout at all so don't require cyclists even to moderate their speed. If this roundabout were of the annular ring design then there is absolutely no way that I could cycle past it so quickly. Note that the return journey for both the woman and myself involves crossing fewer arms of the roundabout than would be the case for an annular design. The bidirectional cycle-path helps here, making left turns into immediate left turns rather than requiring the cyclist to travel all the way around the roundabout. Again, this vastly improves convenience relative to the annular ring design. If we had the annular type of roundabout in that location then cyclists' journeys would on average take longer than they do now. Please also note that the other junction design which I recommend highly also has a proven record of improving both safety and convenience for cyclists. It's very important that cyclists' journeys are made to be convenient as well as safe. In cycle-hostile countries, all these factors become even more important, but we must also consider the huge factor of Subjective Safety as it is the danger of cycling which is the biggest issue stopping people from riding bicycles. This is why I recommend these especially safe and convenient junction designs above the less successful alternatives. Bidirectional crossings are safe if cyclists have to give way. In the case of Enschede roundabout both collisions of cars and cyclists involved those traveling against traffic, because apparently they behaved like they'd had right of way if they had traveled in correct direction. 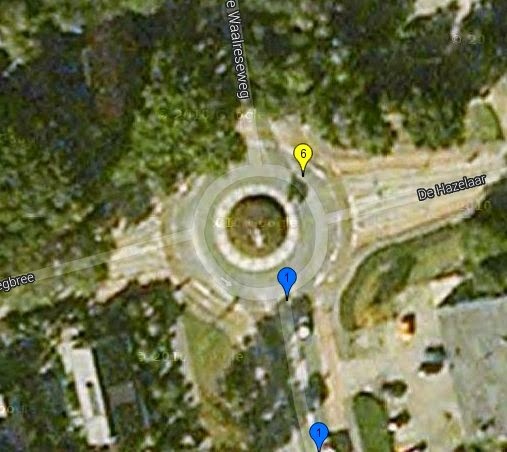 As for Zwolle bicycle roundabout: would you prefer the older situation, with long waiting times for cyclists crossing the road? Most people would not, no matter how good safety record it had. That's because new design is not only convenient, but also has very good subjective safety. Why talk about ordinary junctions? Because I think it's a good analogy. One might argue that along urban roads there should be bidirectional cycle paths on both sides, with sharp turns at every junction and obligation to give way to cars (but with 90 degree crossings) - not only because it would probably be "safer" solution, but because you could then choose side of the road with fewer interactions with cars and you could turn to and from streets on this side without dealing with cars on the main carriageway at all (that's exactly why sidewalks are bidirectional). And in some cases he'd probably be right. But in most situations non stop cycling along the main road is more important. The same with roundabouts - if you think that in particular location applying bidirectional crossings without priority would improve convenience of cyclists, then do it. But let's say cycle paths in all directions are unidirectional (and in urban areas usually they should be). In Assen design, cyclists turning left would have to wait twice, which would take especially much time when there are many cars crossing. In standard Dutch roundabout design, they wouldn't have to stop at all (maybe apart from giving way to other cyclists), while having the same amount of interactions with cars. Apart from multilevel solutions, this is easily the world's most cycle friendly junction design, and you say that other nations shouldn't copy it? user1: The problem which you describe in the case of Enschede is that the infrastructure design encouraged people to do something which was not safe. Whether people were supposed to do this is not the issue. Infrastructure should be designed such that correct and safe use is obvious due to the design. I thought I'd made it clear above that I don't yet have an opinion on the Zwolle bicycle roundabout. The reason why I don't have an opinion is that it's too early for any of us to have an informed opinion on this because we do not yet know what the outcome is. Wait a few years, see what happens. As for "good subjective safety", I disagree. Roundabouts with cyclist priority do not generally have good subjective safety. You cannot rely upon drivers giving way and unpleasant incidents are quite frequent. That design works reasonably well in the Netherlands because Dutch drivers are used to cyclists and rarely hostile towards them. 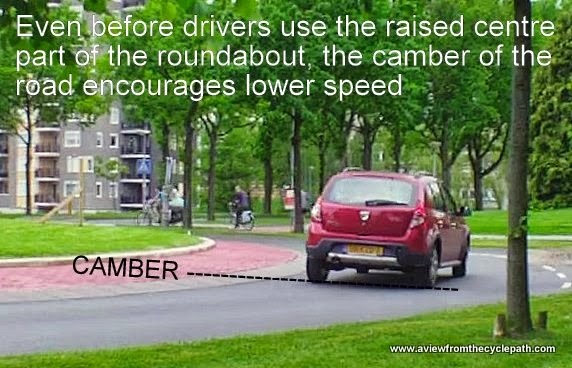 This can't eliminate error, which is just as frequent with Dutch drivers as with the drivers of any other nation, but it does almost entire eliminate aggression on roundabouts. However, my blog is mainly targeted at other countries where drivers are not used to bicycles. They find it more difficult to estimate the speed of cyclists and they are less likely to expect (and therefore to "see") a cyclist. What's more, drivers in other nations are quite often hostile towards cyclists. That is why any design which relies for safety upon driver behaviour always being correct will work less well in other countries than it does here. When you say "In Assen design, cyclists turning left would have to wait twice" you make the situation sound much worse than it actually is. In reality it's actually rare that you have to stop. I ride across the roundabout in the video every day and I can't remember when I last put my foot to the ground there. It's almost always possible to ride across with a slight alteration to my speed. People have to alter their speed to join annular cycle-path design roundabouts as well. You have acknowledged already that it's necessary to give way to other cyclists, but in reality you cannot ignore car drivers either and have to consider what they are doing each time you cross the car lanes. Due to the design of the annular paths this is made difficult, particularly for elderly or disabled people who have problems turning their heads, because the approach to the crossing is not at a 90 degree angle. It's not safe to ride onto or around that design of roundabout without considering the motor traffic because you cannot be 100% sure that drivers will never make a mistake. As a cyclist you know that you will be the one to be injured if a mistake is made by the driver. The problem with the annular cycle-path design is precisely that it relies upon perfect error free behaviour in order to achieve safety. That is precisely why it is not safe in reality even here in the Netherlands. I do not consider the annular ring design to be the best junction because the design of roundabout which we have in Assen is equally efficient in real life situations and also demonstrably safer in the Netherlands with reference to real accident statistics. The difference in outcomes will be even larger in countries which are more hostile to cyclists so I absolutely could not in good conscience recommend the more dangerous design for use in other countries. Finally, I appreciate your comments, but I'd like to know who I'm having this discussion with. Can you please use your real name if you reply again. My name is John, I'm from Poland and I'm a regular follower of your blog and others about Dutch cycling. Virtually no design can eliminate 100% of incorrect behavior. Surely you've seen many times cyclists riding against traffic, not giving way where they should, running red lights etc. even on most self-explanatory Dutch infrastructure. While it's important to make sure that these rules meet most people's needs and make them obvious for everyone, it's unrealistic to expect that no one will break them. I agree that roundabouts with a cycle path close to the roundabout carriageway are controversial. Maybe it should be bent away further, but without loosing priority. 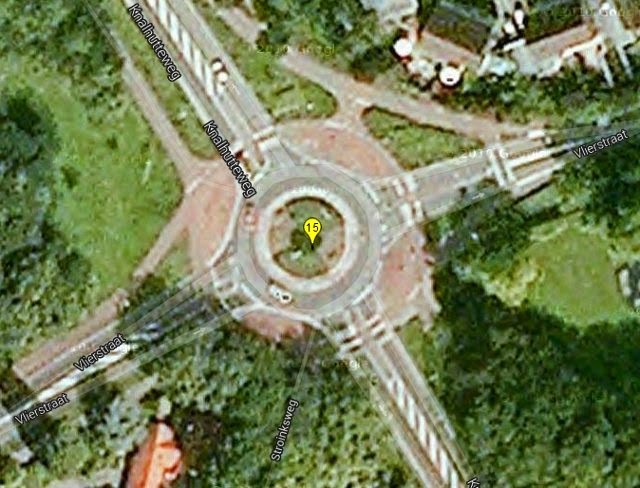 Many examples of cycle paths with priority around a roundabout which are not perfect circle can be found in the Netherlands. However, when there's too little space, no solution will satisfy everyone. Simultaneous green junctions won't do either. Where I live, people hate traffic lights, believe me, and everyone wants a roundabout instead. What I disliked very much is that in your post you discourage from using annular ring design, even if there is enough room for good sight lines. Turning radius of about 20 m means that the angle of crossing is only slightly different from 90 degrees. This can be even improved further by making a cycle path wider, for example. Roundabout with cyclist priority doesn't rely on driver behavior more than any other junction design with cyclist priority. You can never be sure that every driver will give way to you, but that doesn't mean that drivers should always have priority over cyclists. However, it's not only driver behavior which this design relies upon. Roundabout geometry, if well designed, makes sure that car speeds are low. If not, then perhaps additional traffic calming should be used. 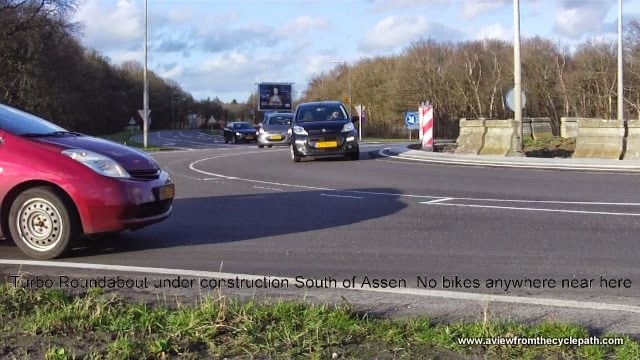 By “Assen design” I didn't mean just the roundabout shown in the video. I meant design principles used in all roundabouts in Assen (at least those which have cycle paths at a ground level). If you say that people rarely have to stop while riding through this particular roundabout, it means that there are few enough cars so that it's easy to find a gap in traffic. When traffic volumes and speeds are low, having priority or not isn't a big issue, no matter if it's a roundabout or any other kind of junction. It's no surprise then that there are no reported collisions between bikes and cars in that location. If traffic volumes were higher, then surely there would be more impatient cyclists not wanting to wait for their turn. In such case, if all cycle paths were unidirectional, left turning cyclists would indeed have to wait twice, not to mention giving way to other cyclists as well. IMHO in Assen there is no need for cyclists priority at roundabouts because of relatively low car traffic. BTW, in David's position I see two separate points: annular vs 90 degree designs AND priority question. It's true that no design can eliminate 100% of incorrect behaviour, but we can come close. For instance, the frequency with which people cross the road against a red light is greatly reduced if the time which you have to wait for green is shortened. It is one of the principles of sustainable safety that roads and cycle-paths should be self-explanatory and easy to use correctly. Such design reduces the frequency of mis-use and that leads to a reduction in the frequency of collisions and injuries. The reason for my stance in the blog post is that the statistics appear to show that priority is a greater problem than the annular ring design. Look lower down in my blog post at the examples from Eindhoven. One of these actually looks more like an Assen roundabout, but it has still proven to be more dangerous than an Assen roundabout. If you enter a roundabout with cycle priority and ignore what the car drivers are doing then you are absolutely reliant on correct behaviour. This is something that we cannot rely upon. You cannot legislate to make people behave perfectly in difficult circumstances. To try to do so is to pretend that human failings can be overcome by simply telling people to behave otherwise. You've misunderstood why we don't have to stop often. It's not that there are few cars but that sight lines are long and it's possible to plan long in advance how you will merge into traffic safely. That is why it works so well. With the annular ring design, people have to make their decisions far closer to the potential conflict point, making those decisions more rushed and more difficult to make correctly. The reason why I included so many other examples was to demonstrate that yes it is an issue whether volumes or speeds are high or they are low. Some of the examples are in larger towns than Assen, some are much smaller towns. e.g. Drachten and Valkenswaard. 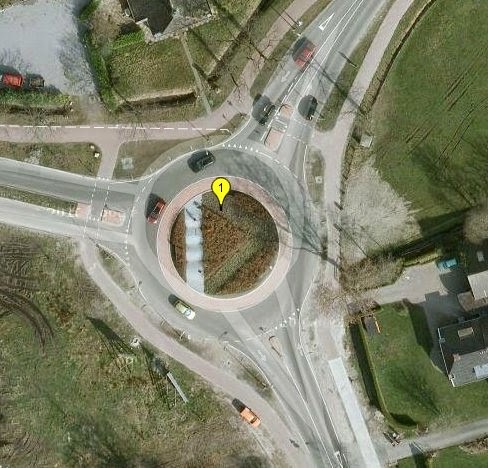 The Valkenswaard roundabout is a good example because this is a much smaller place than Assen and does not have high traffic volumes, yet one roundabout even in that village is more dangerous for cyclists than all 19 roundabouts in Assen. So yes, having priority or not absolutely is THE issue. Just look at the statistics. The message could not be clearer. Edas: Bear in mind that where traffic volumes are high enough that a roundabout could become problematic, it is standard Dutch practice not to have a roundabout. Low car traffic is not the issue here at all. And it's certainly not the case that Assen is small and quiet. Even the examples from Drachten and Valkenswaard, both smaller and less busy places than Assen, show single roundabouts which have higher cyclist casualty rates than all 19 of Assen's roundabouts put together. This is the point. It's not a small issue, but a huge issue. There is more than an order of magnitude difference in the safety of these designs, and that is regardless of traffic flows. 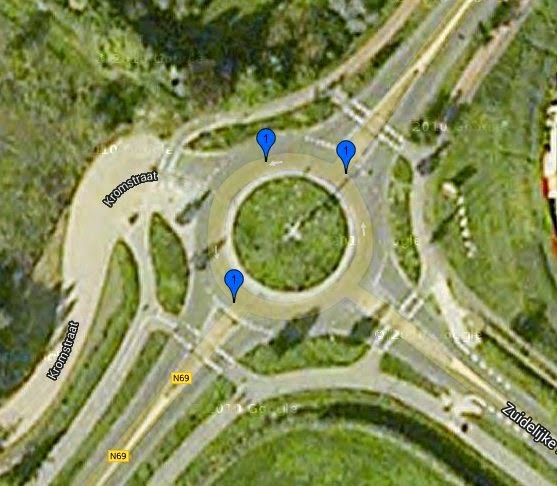 The busiest roundabouts outside cities already use the safer design, and they have good safety records (several of those are featured in the blog post above). There were two rural roundabouts of this type on my long distance commuting route a couple of years back. I rode across them both twice a day at rush-hour for more than a year. Both of these roundabouts had driver priority. Yet just as I've found within Assen, it was rare that I ever stopped for the roundabouts because sight lines were good and I could modify my speed in advance in order to make sure that I crossed without stopping. The safe design isn't only safe, it's also efficient. I've meant that if a road is easy to cross anyway, then lack of priority is not very problematic for a cyclist. However, if you have to adjust your speed while riding a long distance before the roundabout, it's an inconvenience significant enough to be annoying. Imagine that you have to cross every intersection in this way. This is completely different from what you need to do while cycling through a roundabout with cycle path priority – just make sure that at the point of crossing your speed is low enough to break instantly in case of emergency. Again, this is basically the same as with any other junction with priority. I think that a speed of about 15-20 km/h may be low enough, meaning that many people cycling don't need to slow down at all. Roundabouts with cyclist priority have been built all over the Netherlands for the past last 20 years not just because CROW recommends to use them, since new schemes such as Zwolle bicycle roundabout show that people really do appreciate advantages of this design, even when it's far from perfect because of little space available. I agree that cyclist priority is a very significant factor contributing to large number of incidents, no matter if it's annular ring design or any other roundabout design (and, similarly, any other junction design). However, the best solution to this problem is to reduce danger at source - slow down cars, not bikes - because cars are dangerous, not bikes. It's car-centric countries that make obstacles for vulnerable road users in order to reduce casualties. It's not Dutch at all. Slowing down bikes by making them give way is a last resort solution, which can at most be used when everything else fails. It's not something that other nations should aspire to. Just look at the crossing about which Mark writes: "A man cycles towards a junction. At a steady speed, doesn’t slow down, doesn’t speed up. A large truck comes to a full stand still to let him pass. Cyclists on the cycle path have the right of way after all. The man passes, but the truck cannot drive on just yet. There is another cyclist coming and the long truck could never clear the junction in time. So the truck driver waits, until the junction is clear and no new cyclists approach it.". The location for the (bidirectional) cyclist priority crossing is far worse than a roundabout, which would itself reduce speeds. Yet drivers were made to give way – not just by telling them to do so, but by placing the crossing on a speed hump. This is a kind of infrastructure we should campaign for. 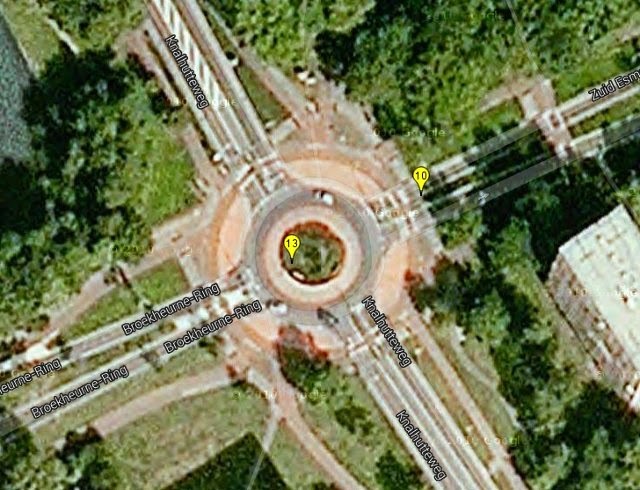 As for Valkenswaard roundabout: the image is blurred so I can't be sure, but small center island and wide roundabout carriageway may encourage car speeds that are simply too high for cyclist priority crossings to be safe. Compare this to the photo of the rural roundabout below that image. @user1: "Virtually no design can eliminate 100% of incorrect behavior." but what matters is that the design mitigates the consequences of a mistake. i.e. the design of the crossing ensures that the speeds of the vehicles are much slower so injuries if any are far less severe. British roundabouts are deadly in that motor vehicles sweep in and out with virtually no reduction in speed at all. Especially vehicles that are turning left at the roundabout. I've had plenty of cars and trucks drive straight through a light controlled crossing that's turning red on them, even had vehicles run through my green man phase. I've witnessed a crash where a cyclist was crossing over on his green cycle phase at a Toucan crossing on the exit of a roundabout and the vehicle involved had swept on and off not expecting to have to stop at all. Luckily, the car involved did hit his brakes hard but he did strike the cyclist and knock him off resulting in damage to the bike and minor injuries to the cyclist. Still got taken to hospital though but nothing was broken. user1 / John: Simply put, you have it completely backwards. The "slowing down" which you imagine is absolutely not an issue. If it were an issue I'd have raised it as such. The joy of cycling in the Netherlands for me is that it is possible to cycle quickly and efficiently to almost any destination. Please watch the videos a second time. Note the first few seconds of the first video. 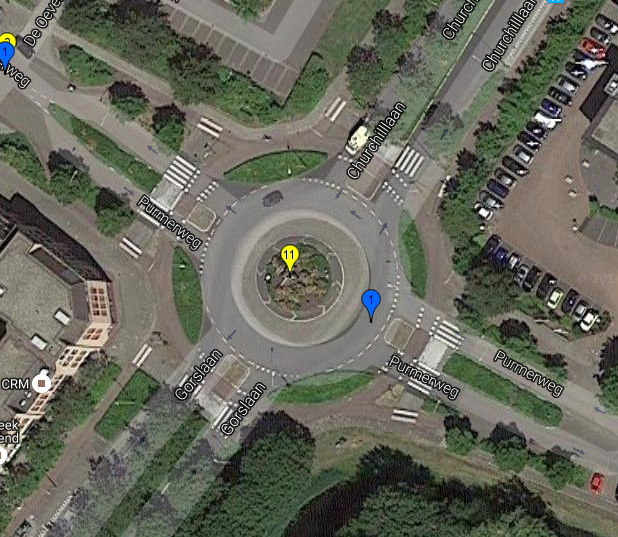 I cross an arm of the roundabout which has been converted into a cycle-only access at considerably higher than 30 km/h. I can do this because cycle-paths are arranged to completely avoid interaction with motor traffic. I usually ride >40 km/h through the tunnel, just because I can and it's safe to do so. These are the two roundabouts which I use most frequently. In both cases usually faster by bicycle than I could in a car. The annular design slows everyone every time. Why accept that ? If there was a safety advantage to dropping to 15-20 km/h at every roundabout then perhaps I'd see the point, but there is none. In fact, it's both slower AND more dangerous. Think carefully about what you are calling for. The annular ring design is neither safer nor more efficient. That is why I suggest campaigning for the safe and efficient design instead. Also note the importance of siting roundabouts only where they are needed. 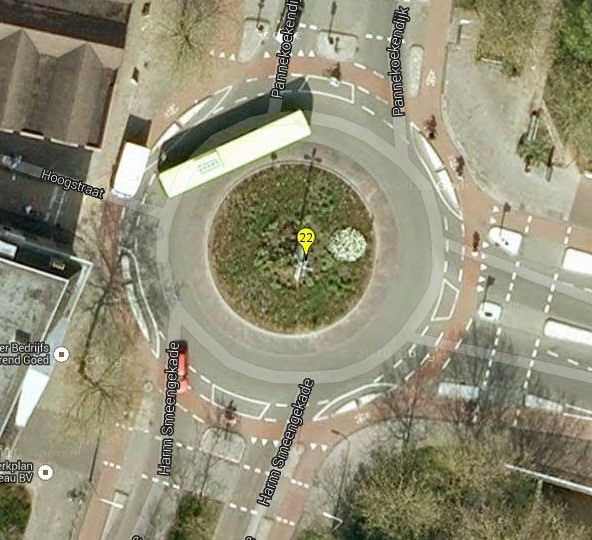 I use only those two with any regularity because in Assen, roundabouts are (correctly) placed almost entirely where needed to cater for drivers' needs - away from cycle routes. 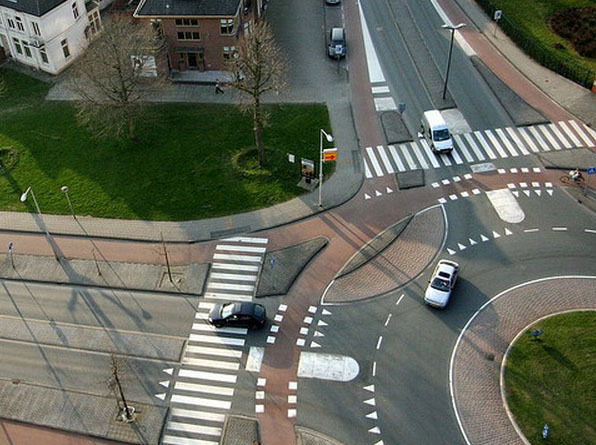 Yes, the more dangerous and slower design of roundabout exists in many places but many things have been tried in the Netherlands. Go beyond "Hooray, Dutch is best" nonsense as you read on some blogs and look at the data and you find that not all of what has been tried works equally well. That's why I say only the best examples of Dutch infrastructure should be emulated. The design which I favour reduces motorist speeds by several means. One of them, camber, is highlighted in the video and in a photo above. Also note the corner radii for motor vehicles, though this varies from place to place. The video which you refer to shows a minor road/cycle-path crossing where cyclists have priority. Relatively low traffic volumes and speeds with good sight lines - it's a very easy example to make work and that is why it works. There were no reported collisions there between 2007-2012. However, it's not a one-size-fits-all solution. Further along the same route there are traffic lights where cyclists give way. Presumably thought to be more appropriate at that location. You can't do everything everywhere. Note that the town in which that crossing exists is by no means a cycling paradise but a Dutch town with some good and some less good points. Its cycling modal share is lower than average for the Netherlands, reflecting lower than average infrastructure quality. A few hundred metres away people habitually cycle along a pedestrian path in order to avoid crossing a wide and busy road - this indicates cycling under stress. The crossing is absolutely not the same situation as is found at an annular ring design roundabout, which as I demonstrate above, have a far worse accident record. There is no sense in trying to pick 'highlights' and then attempting to apply them everywhere. You need a balanced approach, building a dense grid of very high quality routes. That's what really works. Paul: Quite right. Mitigation is the point. The safe design mitigates problems very well, as we can see from the accident stats. The other design does not. Judy and I rode nearly 80 km yesterday planning a holiday route. We rode past seven roundabouts in total on our route. Six of them were the safe design. We rode past five of these without stopping and had to stop at one of them in rush hour for a few seconds. 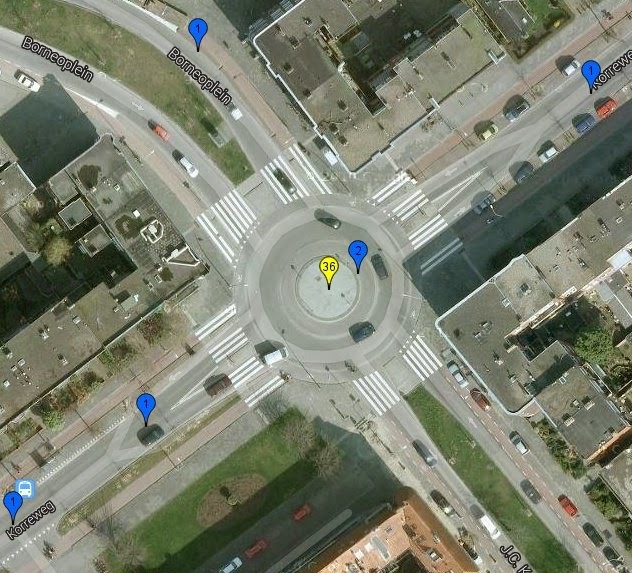 Then there was the seventh roundabout, the safest example in Groningen shown in the blog post. At that junction I had a learner driver enter the roundabout with his right indicator flashing as I was going straight over. I was not at all sure he'd seen me so my attention was distracted by this but as I rode across the roundabout I became aware that a driver who was approaching from my right had not seen me because she screeched to a halt half way across the cycle-lane. Both of them are supposed to have known to give way. Both didn't quite manage to do so. It's been my experience for years that unpleasant experiences on Dutch roundabouts are overwhelmingly on the annular cycle priority design. It's simply not unusual for this to happen because drivers and cyclists alike have too much to concentrate on at once. It was my experience which led to my writing about the better design and I rather regretted letting a guest poster write about the supposed advantages of the other design when I was sure this was not optimal. However, I like my blog posts to be based on more than just hand-waving which is why I waited until I had the actual statistics before writing this blog post. Paul: I can see why you'd have problems there. That is indeed a typical British lethal roundabout design. There's known to be a problem - hence the ineffective "think bike" signs on the roundabout itself. It looks to me like all of the "cycle priority" intersections you cite have cycle paths which are directly adjacent to the road, separated only by a small curb, and as a result the car and bicycle travel lines are crossing at oblique angles. This presumably leads to right-hook type collisions, when a car and cyclist don't notice each other. The danger, then, seems to come from the geometry of the cycle-car crossing, rather than the question of which user has priority. Are you suggesting that the roundabout in Assen would be less safe if cyclists were given priority at the crossings, even if it maintained the same physical characteristics? If so, could you explain more clearly why? And another concern: is it actually possible to implement this design in a physical area as small as e.g. 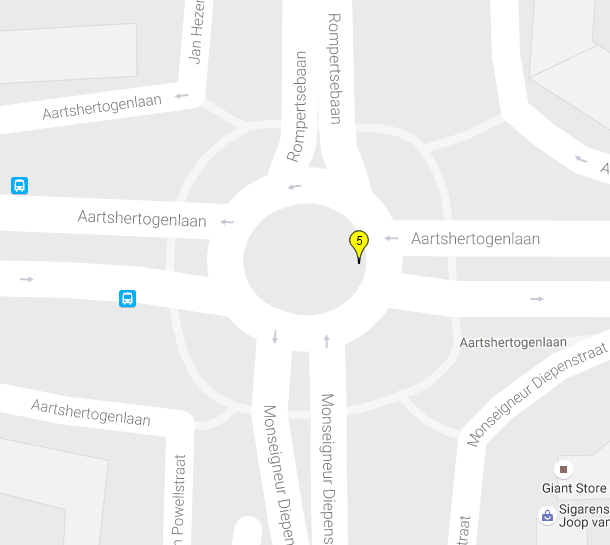 the annular roundabout you pointed to in Zwolle? It seems like it takes up quite a bit more space, given the extra doglegs necessary to have right-angle crossings. Jacob: Yes, I'm suggesting exactly that. Cyclists should not have priority at roundabout crossings because there is simply too much going on and mistakes are made too easily at these junctions. I've explained more fully in an update of the blog post. So, you've updated the blog post again and written that: "Where this is the right solution. i.e. junction design is good, sight lines are long and traffic volumes and speed are not overly high, these junctions have very good, often perfect, safety records." I completely agree that safe cyclist priority crossings require that "junction design is good, sight lines are long and traffic volumes and speed are not overly high". However, there's no reason to exclude roundabouts from this. In fact, it's quite the opposite: roundabout is a great place to cross the road on a bike with priority, since car traffic is slowed down in all directions anyway (or at least it should be). Also note that when comparing safety records of roundabouts and other junction designs, it's important to take into account number of traffic participants using these junctions. For example, if you want to know how safe some busy roundabout is, then compare it with busy T-junction (these often don't require traffic lights) or with many quiet junctions combined altogether. You may find out that roundabouts with cyclist priority are safer than ordinary junctions. Thanks for the detailed update. The safety record does seem quite convincing. I think I share the concern of the commenter above about cases with high traffic volumes and speeds. Of course, however, all bike infrastructure should be site-specific and those circumstances would simply call for a different design (an unravelled route or grade separation). I'm not a fan of motorists getting priority at roundabouts because my experience is that it only happens (in the built-up area) when the local planners have decided they don't care about cyclists (which also admittedly means that roundabouts are left in place where they're no longer really appropriate for the traffic volumes present) and I'm left trying to struggle across a crossing which "feels" to car drivers like they shouldn't stop (of course, this is not necessarily due to the presence or lack of priority markings! ), and thus where no vehicles are bothering to stop. At least with a cyclist-priority crossing I can make pointed eye contact with oncoming motorists and cross once the oncoming cars have actually stopped. It's even worse with a small central island, where I have to stop/start again while trying to make sure I'm not accidentally partially on one of the road lanes. If they're even large enough to actually fit a whole bike, which is sadly not always the case.. This all means that I go out of my way to avoid such anti-cyclist infrastructure because it's so incredibly unpleasant to use - realistically I often have to get off my bike and use the zebra crossing. And this discouragement of cycling is exactly why the Dutch policy is not anti-cyclist-priority in such areas, as I understand it. user1: You appear to be going around in circles in an attempt to prove something which simply isn't true. What you've chosen as your reference was originally published as a guest post on this blog. Buit this is a secondary reference rather than the original source of the data that you're quoting. Roundabouts were introduced to improve the safety of motorists, not to improve the safety of cyclists. Their effect at reducing injuries is far greater for motorists. The SWOV document (and the other one which is linked at the end of the blog post above) goes into more details including pointing out that "the number of injury crashes on roundabouts with priority for cyclists was more than twice the number on roundabouts where they have no priority". It also goes on to point out that the problems are probably because "drivers have to make (too) many observations in a brief time span, resulting in them noticing cyclists too late" and that even when the design of cyclist priority roundabouts was changed, this had "no proven safety benefit" and this document concludes that "from a road safety perspective cyclists should have no priority on urban roundabouts either". It has taken me some years and much experience of both types of roundabout to come to the same conclusion but I now agree with SWOV. The supposed benefits of cyclist priority are not significant but the injuries caused by the cyclist priority design are very real. Jacob: That's right. Where there are high traffic volumes and speeds, a roundabout is simply not the right solution (not for cyclists anyway). Allyssa: That there are bad examples in the Netherlands (there are and you seem to use some of them) does not imply that all examples are bad. SWOV came down quite firmly on the side of not giving cyclists priority on roundabouts because the danger caused by doing so seemingly cannot be addressed by design while cyclists retain priority at the roundabout. As I explained a couple of responses ago, it has taken me several years to reach this position but I am agreement with SWOV. Roundabouts only make sense for cyclists if the traffic levels are quite low. Your comment suggests that you have roundabouts in your area which do not meet current guidelines. Infrastructure being built to the wrong design in the wrong place is not the same problem as that of the fundamental design being wrong. That's why in this case I have highlighted Assen. It's a good example from the point of view of roundabouts. The roundabouts here work very well because the right designs are in the right places. I don't think that makes this town unique, but this just happens to be town I know best where this is the case. It's still not about "giving cyclists control over their own safety", though. It's about improving road safety by acknowledging the fact the fact that cyclists are bad at taking control over their own safety - something you can see in other SWOV research (for example, the increased accident rate when you paint cyclist crossings in red, seemingly caused by cyclists paying less attention to possible motor traffic at such crossings). Yes, SWOV's point of view is that, from a pure road-safety argument, cyclists should not have priority at roundabouts. They also mention the other factors (such as the advantages about predictable design, encouragement of bicycle use, and how the presence/lack of priority markings and signage influence the willingness of drivers to slow down or give way). From a pure road-safety argument it's also clear from recent SWOV research that cycling in general is a bad idea.. "Our model assessment indicates that the number of serious road injuries will increase in almost all scenarios after a modal shift to cycling [...] even if the risk of bicycle injuries decreases by 20% the number of serious road injuries would increase." I think your blog does a wonderful job in general of emphasizing the importance of joined-up design of the entire road network; I just think that your update puts a lot of emphasis on a relatively minor feature (cyclist priority), and calling cyclists "mobile traffic calming devices" is rather mis-characterizing the situation. Alyssa: I disagree with your first point. At priority crossings cyclists have no choice but to put their safety in the hands of motorists. This is a dangerous thing to do because we know that motorists may or may not be paying attention or looking in the correct direction and we know that there are limits to how well humans can ever concentrate on repetitive and "boring" tasks such as driving. The stats are very clear about it being much safer to give cyclists control over their own safety at roundabouts. It's true that many cyclists are reckless. Some people are reckless in any situation. Infrastructure should always be designed so as to mitigate the impact of reckless behaviour. But the problems at roundabouts are not limited to the reckless. How do we best keep the average person safer ? The stats make it quite clear that people (the whole population and therefore a representative sample of the reckless and careful) are on average safer at roundabouts which do not give cyclists priority. SWOV do indeed have a narrow focus and I certainly don't agree with everything that they say. I don't disagree with them because they are SWOV either. 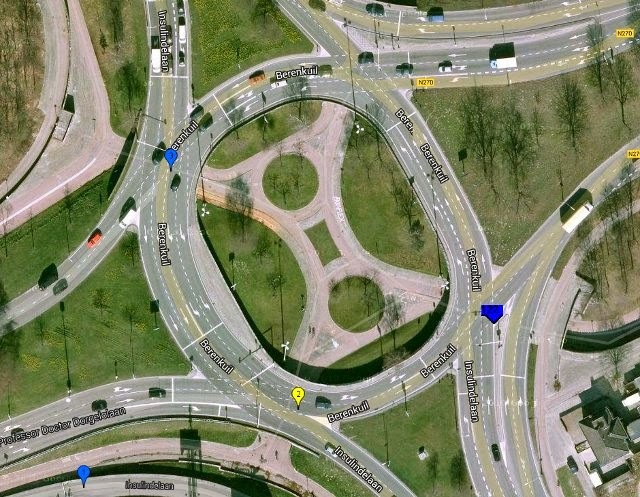 This post is about roundabouts, not about anything else that SWOV have written about. If you had asked me five years ago about the design of Assen's roundabouts I would have told you that they were inferior to those of Groningen where cyclists have priority. This is a simple conclusion to come to and many people have come to the same conclusion. It's the reason why we only emphasized cyclist priority roundabouts to study tour groups in the past (e.g. 2006 above). However, my opinion about these has changed in the face of much experience and supporting evidence. I started writing this blog post over a year ago. In the beginning I wrote about nothing more than my observations about Groningen roundabouts which I used occasionally and Assen roundabouts which I used far more frequently. I was originally going to highlight only the surprising efficiency with which our roundabouts work - they simply don't cause delays of any significance at all as I cycle around the city. Given my previous opinion, this was not what I had expected. As I looked into this deeper it became clear that there was a bigger story to tell. As well as riding across roundabouts, I've also stood next to them and watched. In Groningen I have seen the frequency with which something unpleasant happens to someone else. Occasionally I've even seen crashes. The first example from Groningen featured above is on our study tour route and we demonstrate the problems that this particular design causes. Some study tour participants have seen crashes here between cars and bikes. Each time, the people got up and rode away so those are examples which don't appear in the statistics. The more than time went on, the clearer it became that that while I observed frequent dangerous situations in Groningen, I did not observe them in Assen. Of course at that point I started to look for evidence, coming across SWOV's documents and the ongelluken kaart. My opinion on safety was supported by statistics. This blog post is a reflection of winning on both convenience and safety with the design which we have here. As for "mobile traffic calming devices", there are only two types of infrastructure in the Netherlands which make me feel that way. One is the cyclist priority roundabout, the other is Shared Space. Both have bad safety records. It seems that you feel more experienced in cyclists provisions than people from CROW. I don't think so. What about CROW agreeing, that safety of roundabouts with cyclists priority is worse, but they still encourage to build them? When we are expected to hear from you, that cycle helmets is a good thing, as says SWOV? Edas: CROW describe and recommend both types of roundabouts. I have merely pointed out the relative safety of each type and made a recommendation which is aimed primarily at countries other than the Netherlands. I don't know where you live, but consider this: It was estimated that 52-73 extra injuries to cyclists would occur each year in the Netherlands due to the choice of roundabout which has been made by most towns. The data which I've seen supports this estimation. That number is for a country of 16 million people. These additional injuries to cyclists are caused by Dutch drivers making mistakes at cyclist priority roundabouts. Remember that Dutch drivers have to pass a test which is more stringent than most, that speed limits are relatively low here and that they are enforced relatively well so that in towns at least, drivers here are relatively well behaved compared with some other countries. If you believe that the drivers in your country are significantly more experienced at driving safely in the presence of cyclists and will take fewer risks than Dutch drivers and you believe that your drivers are less likely to behave aggressively towards cyclists then perhaps you can ignore these statistics and expect everything to work out better where you are. If you truly believe that then you can assume that the Dutch have these extra injuries because of Dutch drivers. However, should you believe that your drivers are perhaps are skilled, less experienced at driving in the presence of cyclists, take more risks, or are more likely to be angry at cyclists, you have to consider that the 52-73 extra injuries here could translate into a far higher number in your own country. This post is not about helmets, but you're welcome to read what I have written about them before. I've read quite a lot of what SWOV have produced and not found anything which states as simply as you've put it that "cycle helmets is a good thing". They're a little more nuanced than that. Regardless, it's quite possible to agree with people, or indeed organisations, on some points while not agreeing with them on others, you know. Similarly, I think that in general it's quite a good idea for trains to run on time, but that doesn't imply that I agree with all other policies of Mussolini's fascist government (that's actually based on a myth). Firstly, Comparing casualty figures only isn't necessarily a good measure. Cycle-priority roundabouts are often used where there is (relatively) high motor traffic levels, and/or higher cycle traffic levels. I would also criticise your example in the video, the waiting area between the roundabout exit/entry lanes is too small, especially for a bicycle with any kind of trailer. I agree that other nations will likely struggle with cycle-priority roundabouts, but UK roundabouts (pretty much all of them) have too much motor traffic for motorist priority to work. You do acknowledge this in your post, but not very prominently. 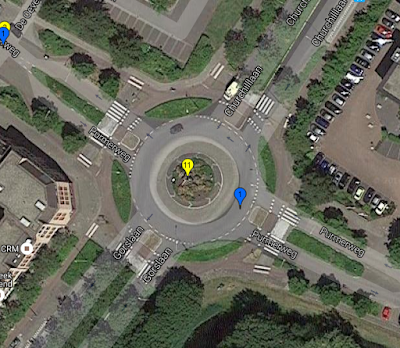 I'm not sure where motorist-priority roundabouts belong if only on low traffic routes (under 2000 or 1500 PCU/day)? Wouldn't a common give way crossroads with cycle priority be perfectly good enough? i.e. i.imgur.com/cKXJ8IH.png or http://www.cycling-embassy.org.uk/photos/good-cycling-facility-of-the-week/good-cycling-facility-of-the-week-5th-december-2013 . Andyk: The highest capacity roundabouts with highest speeds actually use the motor priority design. It is only within towns that the cycle priority design is used. While the waiting area may look too small in the video, I use it often with a trailer and I can assure you that it works. CROW recommend not having a roundabout in high traffic conditions such as you are discussing and so do I. Without grade separation, a simultaneous green traffic light then gives maximum priority for cycles with minimum interference for other modes. The "facility of the week" that you use as an example is similar in appearance to "the most dangerous junction in the Netherlands". Your example avoids some of the problems of that junction and has a lower accident rate, but it's by no means perfect, having caused many crashes and six injuries in five years (four to cyclists). The other example that you give is of a very large and partly grade separated junction. I don't think it's really comparable with anywhere that you should be considering a a roundabout for cyclists. Why do you think that Simultaneous Green would cut capacity for motor traffic when compared with another arrangement of traffic lights ? Actually, simultaneous green makes very efficient use of time. Because cyclists go in all directions at once and can clear a large junction in a very short time, they delay for motor traffic is less than would be the case if several different phases were used for bikes. Cyclists cause less of a problem than pedestrians, who take a much greater time to cross the road. Thanks for the response David. I picked the "facility of the week" as the principle is similar to the 3-way junction with a priority track you supported as safer than a mini-roundabout. E/W traffic has priority over N/S traffic or vice versa. I do note this crossroads in Amsterdam has relatively wide geometry and an unusual centre area of road between the carriageways. I mean that roundabouts in general have a higher capacity and safety than a signalised crossroads. This was demonstrated at Poynton, UK where a multi-lane signalised crossroads was replaced with a double "roundel" roundabout junction. I don't think a signalised 4-arm junction would go down well somewhere like here. In countries such as the UK, at major roundabouts you often have a constant stream of motor traffic. I found it inconvenient/difficult to cross the (single lane) arms of the Egham roundabout on foot (or by bike - some "infrastructure" has been provided) as it is hard to judge if a circulating vehicle is about to leave the roundabout and run into you; at peak times the circulatory will have a constant stream of vehicles going somewhere or another. Would speed reduction (adverse camber, narrower circulatory, increased deflection and so on) be enough? What would be your suggestion in a situation like this, or this? Pedestrianise London's traffic-controlled turbo roundabout with cycle crossing phases would certianly seem a good option at high-traffic locations compared to a simultaneous green junction. Poynton has been the subject of much hype in the last year, but the designer and other advocates of the design don't seem to be able to justify themselves at all. Take a look at this blog post and the responses to it. One of the problems with what you're asking for is that you want a design which can be slotted into the existing roads with their existing usage. This is not the way in which things have been done in the Netherlands. Over here, the traffic has mostly been taken out of locations like those which you use to illustrate difficult junctions. Rather than an approach of trying to fix each junction individually, a different approach has been taken, of changing the networks of roads used by cars and by bikes. The resultant unravelling leaves bikes on the main routes, while cars are mostly sent out of the towns. This is why seemingly similar junctions do not have to deal with so many cars in the Netherlands. The Pedestrianise London attempt at drawing a Turbo Roundabout is, I'm afraid, not really helpful. Unlike the author of that page, I actually live here. I've never seen a Turbo Roundabout which resembles his drawing. Turbo Roundabouts are really only suitable for locations where there are no bicycles at all. He's not the only one to make that mistake, but I've blogged about this, including pictures of real turbo roundabouts, which demonstrate how they are rarely near cycling routes, let alone anywhere near town centres. David, can you please explain how "motor vehicles per hour" is counted by CROW. "CROW suggest that roundabouts are appropriate only on junctions with up to 500-1500 motor vehicles per hour on the busiest arm of the roundabout." Is is peak traffic or is it an average for maybe 8 hours on a typical day, or average for 24 hours. I am trying to convert it into Average Daily Traffic to see what would make sense for specific intersections in the USA. Huge thanks for all your work. improves safety for all users." Living in the UK, this made me laugh. You have a culture of driving as safely as possible : here people drive as dangerously as they dare ! If a car crashes, it is not the driver's fault - the road is dangerous ! “I'm sure a lot of the crashes have been because drivers are going too fast but there is also clearly a design fault with the roundabout as the road surface slopes in the wrong direction." Im not a traffic planner but roundabouts seem like a very expensive way to make an intersection and they can be very complicated too which i dont think is a good idea. Keeping things simple is the way to go in my opinion. Im a fan of the 4-way green light(for cyclists) intersection they have in Groningen (Zuiderpark-Trompsingel/Ver. Oosterstraat-Oosterbrug) which i think you mentioned before in this blog. Its not perfect but i think its beautiful in its simplicity. Dont know how applicable that method is for other intersections though. I think the way that a cyclist would rarely stop on a roundabout without priority is that cars are significantly fewer in number. If there are no cars to yield to, no inconvenience even without priority. If there are a hundred cars to yield to, then there is going to be a long wait. Too bad the Zwolle fietsrotunde didn't work out. It would have made a great way to have cycle priority crossings over a distributor road. I wonder whether it would become sufficiently safe if the geometry Assen uses, but with cycle priority, plus prohibiting traffic to come in and out of the fietsstraat on either side (I mean what I say, this really is how the Zwolle roundabout is organized) making it a straight only crossing. The turbo roundabout with cycle at grade Assen geometry priority roundabout is likely to give useful information, although in Zwolle's case not nearly so busy, and also not in need of the extra lane on the roundabout and approaching turning lanes. If Assen or somewhere else with similar at grade cycle non priority crossings tries a similar experiment as the turbo roundabout cycle priority crossings too but with a single lane, it would be a breakthrough for cyclists, a safe and convenient crossing. 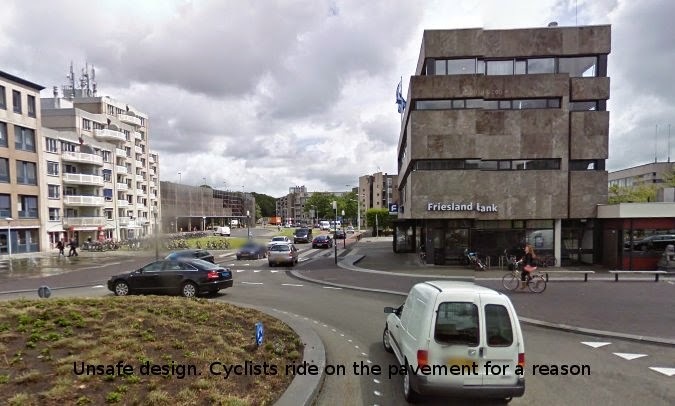 Given that Zwolle was only building a cycle priority roundabout because the original design made cyclists wait, even with a median refuge that was wide and made motor traffic go around it in a sharp curve, what would the fietsrotunde be replaced with if Zwolle decided that safety was more important than having an exceptional roundabout? I think it's a competition between an ~8 second max delay traffic light like you have in a couple places in Assen, possibly turning to flashing amber at night, or what it was before. Neither ideal, but at least they should be safer. Simply counting bicycle collisions at a single location doesn't really give a quantitative assessment of safety there. You also need to consider the overall traffic volumes (both bicycle & motor vehicle) to calculate the overall accident rate. My guess is that the urban roundabouts which you're criticizing have a much higher volume of bike traffic than the rural examples you've praised. Christopher: Please take another read as I'm afraid you've misunderstood. I'm not comparing urban roundabouts with rural roundabouts but differing designs in similar locations. The safer roundabout design has proven to be safer in urban settings than the less safe design. It's proven to be safer with the same volume of traffic. Indeed, research quoted above shows that changing just one aspect of the design of the less safe type of roundabout was enough to reduce the danger in the same location by a factor of seven. No-one has used or proposed to use the less safe design in a rural setting because it's so abundantly obvious that that would not be safe due to higher vehicle speeds and poor visibility of cyclists by drivers.